Hi Chris, good post. To me it seems what as you proposing can be done with a simple RDF schema that incorporates the semantics you posted on the wiki. Next step is the social service developers agree to follow it with the data they send out from their APIs / web services. Currently even if there’s no standardization, a life-activity stream service can deal with say 30-50 APIs (see number of services aggregated by Friendfeed) by custom-made python/perl/java code for each API. But this cannot scale up as the number of APIs increase; think about if we didn’t had RSS, or to bring you an example from my own field, when trying to built bioinformatic web service workflows (essentially a mashup) where you try glue together different outputs from one API as input to the other. After all the mess was created, people try now to come up with ontologies in order to standardize the web services’ communication endpoints. But I like your idea, since you propose the standardization before we get to the point within the next couple of years, of too many and much different social APIs, that we need to mashup and aggregate in activity stream – meta social services. Well put Chris. I liked when you explained the push-based portion of DiSo and being able to selectively filter which parts of a person’s activity stream you follow and how closely you follow it. Would you say that activity streams are almost necessary for applications that expect there to be some interactivity between its users and try to establish/identify relationships between users and their activities/fringing on semantic web? Interesting thoughts. 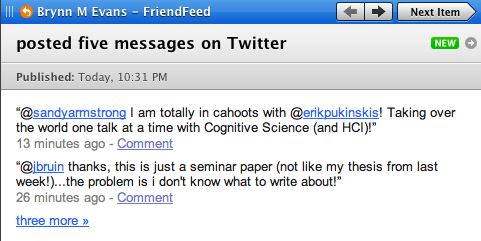 FriendFeed gave me also some ideas regarding social presence streams publication and aggregation. In this case, I assume everything is published in XMPP and that HTTP resources are polled by a backend service for a Pubsub publication. I had the idea of a WordPress PEP aggregator which would be a mix of the PEP aggregator and the DiSo ActionStream plugin. The WP PEP aggregator would publish XMPP PEP events (user-tune, user-mood, user-activity, user-location but also user-browsing – for social bookmarking – and the others PEP events) on a dedicated page or in blog column. PEP messages could be published in real-time with a BOSH-COMET-AJAX technology (I don’t know much of XMPP over HTPP) for example in a similar manner than this Flash page that displays BBC Radio tunes. Users could decide which data to publish publicly thanks to the Pubsub access model. And contacts would select which streams they want to follow using the Pubsub auto-subscribe and filtered notifications capabilities or with manual subscription. There’s also the great Pubsub content-based subscription system to consider, but mostly for other types of social presence streams. It might then be possible to mix social networks services streams with PEP ones by publishing them with new Pubsub/PEP messages types which could include specific namespaces according to services. There’s also the proto-XEP Microblogging over XMPP to consider, but I haven’t thought much about its use. I’m not sure all types of activity streams events worth to be considered, at least that they worth a notification. One problem with all those streams is that they interrupt a lot, so it might be interesting to distinguish “monitoring” vs. “notification” ; the first would use presence, the last, messages. I’d like also to see a way to publish blog comments with XMPP but haven’t found yet how to do so in a easy manner. Another interesting path to explore is the mapping of Pubsub nodes and AtomPub collections as experimented here, here, here and there. But this backend lacks some RDF or at least search capabilities, though I’m not sure. Hopefully, new Jabber GUI will be designed to display the streams in a ergonomic manner. All of this is essentially XMPP centric and lacks HTTP interfacing but I’d need to think more about this, specially how to bootstrap fetched API data with Pubsub. It’s also a 30,000 feet view but I hope it could give more ideas to others. I had these ideas after I read about FriendFeed chat-rooms which made me think to the pubsub#replyroom option. And BTW, Jabber-Feed, an ATOM Pubsub WP plugin would probably be useful for DiSo. Good post. It’d also be interesting (for me at least) to look at how to manage varying expectations of privacy for different types of activity. It is interesting to think about a standardized way of capturing meta-data of use/activities. I believe that there might be a lot of interesting uses of this type of information. About a 1.5 months ago with a similar motivation in mind, we have started User Labor. With User Labor, we propose an open data structure, User Labor Markup Language (ULML), to outline the metrics of user participation in social web services. You can check it out at http://userlabor.org. Shoot me an email if you would like to talk more about this. It’s interesting. Technological innovation has always rode on the back of standards. AC electricity at 120V. 8 bits in a byte. TCP/IP. HTTP. XML. Then in the mid 90’s, the entirety of Silicon Valley seemed to have collectively thought, “We don’t need anymore standards”. They proceeded to build services (some awesome, some not so much), and forgot about forging standards to provide some foundation for the innovation they were doing. Since 1997, there really hasn’t been a truly game-changing, market-shifting standard to come about. The closest thing I can think of is RSS, but regular folks really don’t use it. The work DiSo is doing by leveraging OpenID, OAuth, Atom, XMPP, et. al. to create an infrastructure based on open standards really is quite revolutionary considering what the industry has been like since the 90’s. If more data is needed (ie, listened to a song with artist and title) – then use the correct existing format (ie, haudio) – which the parser knows is present based on the verb. <a rel="bookmark" href="http://twitter.com/singpolyma/statuses/835641714" class="verb" title="posted message">tweeted</a>, "
<span class="entry-title entry-content">Anti C61 images: http://www.cmcarts.ca/DRM.htm</span>"
Thanks for kicking this off Chris. We’ve done a lot of thinking about this as well at MyBlogLog and Yahoo and look forward to contributing to this discussion to include more services. Don’t forget the translation of these verbs into additional languages as well as shorter representations for mobile interfaces. One thing I would advise today is the grouping that you talk about needs a time-sensitive trigger. On MyBlogLog we group a user’s tweets into hourly clusters for the first 24 hours but after that we group all tweets into daily clusters. Otherwise twitter (last.fm also shows this trait) tends to dominate the lifestream. I think this standard should include also the notion of importance. Today when you subscribe to so many activity streams, they start to get the problem with RSS – there are too many things to read. If you tweet about a new job you got, I’m sure you see this as a very important thing that is important enough to push to al your friends. While if I just tweet a remark about the game I watch now, I understand that it’s not important enough to interrupt my friends activity at the moment. FYI, there exists a new Ejabberd-OpenID module and an Ejabberd-AtomPub module is being written. They might be of interest, IMHO. BTW, the OpenID form considers that the length of my base64 OpenID URL is too long, hence the truncating on my first comment. A very timely post Chris. We’re soon going to see an explosion in location based services take place and players in that space would do well to heed your advice and ensure they can effectively associate stream data with real-world objects where appropriate. I think we’ll see a slight shift in focus from being purely people based, i.e. the “it’s all about me” social factor; to us becoming obsessed with, “tell me about…” exploration as a result of attaching contextualised geo-coded feeds to real-world objects. The Ejabberd-AtomPub module has been released. The examples on your wiki hepled me to implement my own version of a primitive activity stream. i’d like to know if there are any efforts to implement this kind of plugin for joomla. So far i have seen some plugins for wordpress. Do you know of any development effort beeing made for joomla?